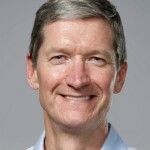 Tim Cook is an American businessman, born in Mobile, Alabama in 1960. He is the CEO of Apple Inc. This is a truly amazing group of people. I won’t tell you the hundreds of calls we’ve had asking to come to this meeting. I’m here to help you folks do well. And you’re doing well right now and I’m very honored by the bounce. They’re all talking about the bounce. So right now everybody in this room has to like me — at least a little bit — but we’re going to try and have that bounce continue. At the Wall Street Journal’s WSJDLive conference in Laguna Beach, CA, Cook says that massive change is coming to the car industry, but does not say whether Apple will make a car. It would seem like there will be massive change in that industry, massive change. You may not agree with that. That’s what I think. On the fourth anniversary of Jobs’ death, Cook sends a memo to Apple employees. Each year since his passing, I have reminded everyone in the Apple community that we share the privilege and responsibility of continuing the work Steve loved so much…What is his legacy? I see it all around us: An incredible team that embodies his spirit of innovation and creativity. The greatest products on earth, beloved by customers and empowering hundreds of millions of people around the world. Soaring achievements in technology and architecture. Experiences of surprise and delight. A company that only he could have built. A company with an intense determination to change the world for the better. In an interview with NPR, Cook says that Apple is committed to its customers’ privacy. We do think that people want us to help them keep their lives private. We see that privacy is a fundamental human right that people have. We are going to do everything that we can to help maintain that trust…Our view on this comes from a values point of view, not from a commercial interest point of view. Our values are that we do think that people have a right to privacy. And that our customers are not our products. We don’t collect a lot of your data and understand every detail about your life. That’s just not the business that we are in. Speaking at BoxWorks, the annual conference by cloud storage firm Box, Cook is asked “What’s next for Apple?” by Box CEO Levie. We haven’t even started yet. Keep in mind our goal isn’t to be the biggest. We’ve always wanted to make the best, and we’ve always believed very deeply that if we made the best products, we can keep investing and doing more work. We’re still doing that, and that part of our DNA is very much the same as it’s been. I think that Tim Cook and I probably both went a little too far. And I apologize to Tim Cook. I hope when he sees the movie, he enjoys it as much as I enjoy his products. Sorkin criticizes Cook’s recent assertion that filmmakers are being “opportunistic” in making films about Steve Jobs. Nobody did this movie to get rich. Secondly, Tim Cook should really see the movie before he decides what it is. Third, if you’ve got a factory full of children in China assembling phones for 17 cents an hour you’ve got a lot of nerve calling someone else opportunistic. Channel was down by 600,000. We sold more units than we thought we would. We always run with just the inventory we thought we need. In this quarter, we were able to end right at the bottom end of our range. Revenue would have been higher if we expanded channel, but that’s not how we think of the business. Cook joins the Chinese microblogging site with a reference to a recent Apple announcement about clean energy and environmental programs in China. Hello China! Happy to be back in Beijing, announcing innovative new environmental programs. Cook tells Fortune that he will give away all his wealth after he provides for the college education of his nephew. Cook’s net worth is about $120 million. He also holds $665 million in restricted stocks. Cook says he has already begun making donations, but rather than simply writing checks, he wants to develop a systematic approach to philanthropy. Apple watch is like having a coach on your wrist.It is the most personal device we have ever created and can display a variety of faces ranging from a classic watch to an animated Mickey Mouse. With the built in speaker and microphone you can receive calls on your watch. I have been wanting to do this since I was five years old. He says it has helped him develop empathy and understand what being in a minority is like. It’s been tough and uncomfortable at times, but it has given me the confidence to be myself, to follow my own path, and to rise above adversity and bigotry. It’s also given me the skin of a rhinoceros, which comes in handy when you’re the CEO of Apple. Apple CEO Cook fires back at CVS and Rite Aid for blocking Apple’s new mobile phone payment system. Cook claims that over a million users signed up for the service in the first week. We’ve got a lot more merchants to sign up, we’ve got a lot of banks to sign up and we’ve got the rest of the world. Sales for iPhone 6 and iPhone 6 Plus exceeded our expectations for the launch weekend, and we couldn’t be happier,We would like to thank all of our customers for making this our best launch ever, shattering all previous sell-through records by a large margin. While our team managed the manufacturing ramp better than ever before, we could have sold many more iPhones with greater supply and we are working hard to fill orders as quickly as possible. Cook poses for selfies with customers outside the Apple Store on the day of the iPhone 6 release. Cook accepts the ALS Ice Bucket Challenge and nominates Bob Iger, Dr. Dre and Michael Franti. As CEO, I’m not satisfied with the numbers on this page. They’re not new to us, and we’ve been working hard for quite some time to improve them. We are making progress, and we’re committed to being as innovative in advancing diversity as we are in developing our products. Apple believes equality and diversity make us stronger, and we’re proud to support our employees and their friends and families in this weekend’s celebration. This [upgrading] is particularly important for Android, which dominates the mobile malware market.